The H&M roster has long delivered on stalwart menswear. And the group just got even better, thanks to the launch of Arket, an in-between label that finally clinches the sweet spot between quality, cost and style. See this forest green essential for further details. For anyone still reeling over the horror that were ‘Save The Rave’ tees, know that today’s sloganwear is much more muted. Topman’s offering extrapolates a Beyonce lyric on a sharp monochrome sweater for the off-duty. Oh come on, she’s better than the Klaxons. On paper, paisley and tiger print make for the unlikeliest of bedfellows. Ted Baker, however, woos the two into a happy marital bed of old school illustrations and cotton goodness. Factor in the wearable colour palette, and this becomes an affair to remember. See that shining ball of fire in the sky? Yep, enjoy it while you can, because summer is officially on the wane. Good news, however – you can start prepping the transitional wardrobe with Private White’s modern play on military fatigues. Winter is coming (and we can’t wait). Save a horse, wear a cowboy. Or a space one for that matter. Swedish label Our Legacy’s embroidered overshirt features four horsemen of the cosmocalypse, launching a menswear classic well into the stratosphere. Wardrobe staples aren’t sacred. Much like Reiss’s Sail polo top, there’s room (and indeed, encouragement) to mix up the usual suspects – this time, with a simple zip detail in lieu of standard buttons. Slot it under your blazer for an updated way to dress down a suit. Trousers are for life, not just for Christmas – especially if you go Prada. What will likely be a firm wallet dent will serve you for decades, flitting between the nine-to-five and your civvies with the swish of a plain white tee. Harvey Nichols’ latest collab with Beams has resulted in this standout ‘I See You’ t-shirt. Which is a huge step up (and a more stylish alternative) to the slogan tees at Gatwick Airport. Just don’t pair with three-quarter length tracksuit bottoms and wet look gel. Forget the Japanese: we Brits do selvedge denim just as well. And although Marks & Spencers may not be the natural choice for some new legs, an immaculate cut is every inch the fashion week corner hanger / redneck beer-swiller (delete as appropriate). 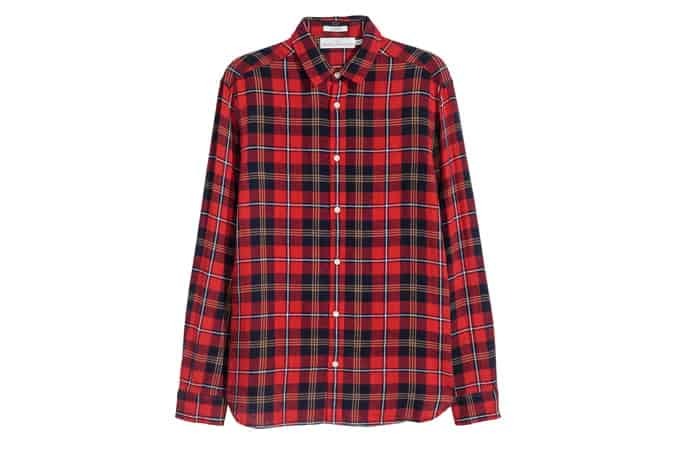 While we’re on the topic of the American west, complete the Rust Belt look with H&M’s lumberjack checked shirt. Whether layered or alone, oversized or to fit, simply team with a cabin in the woods and a forlorn tale about life back in the city. Swiss watches aren’t all conservative boardroom tickers that you daren’t even bring out of the box. Farer’s Lander GMT (British, but made in Switzerland) is a fine combination of painstaking function – which is reflected in the price tag – and something that genuinely looks great on your wrist. Recently revived label Band Of Outsiders is back for round two. And, if this minimalist white tee with the mere word ‘outsider’ to the front is anything to go by, we very much welcome the chance for a second opinion. The boots that made Dr. Martens famous are hardly office-appropriate. So take it down a few inches with these classic kicks, newly restocked at Amazon – a perfect anchor for punk conventions and head office alike. The high street can serve the classics just as well as any luxury label. Burton – a brand that’s been peddling menswear since 1904 – has spun a traditional take on the mac that does exactly what it says on the tin (and won’t break the bank, either). We’re not recommending you crack a whip and wear a sable fedora, but Indiana Jones of Lost Ark fame is quite the style icon. Don’t believe us? Check out this Barbour x Land Rover mash-up (exclusive to John Lewis) that’ll traverse a staple look as well as any Temple of Doom. ‘Men’s jewellery’ is a term that sends a shudder down many a spine. It needn’t be this way though, and for that, we can thank Allison Bryan’s silver cuff – a simple take on excess that packs a quiet shimmer (as opposed to a blinding flash) right on the wrist. Sun chasers, rejoice. What will likely be your last holiday for 2017 should be served by a pair of swim shorts to mark the late-season send-off, much like these luxury printed swimmers from Brazilian label Frescobol Carioca. See, camo isn’t just worn by backing dancers on The X Factor. As the latest partnership between all-American heavyweights New Balance and J. Crew, these 997 kicks go into the jungle without a bountiful use of war paint.